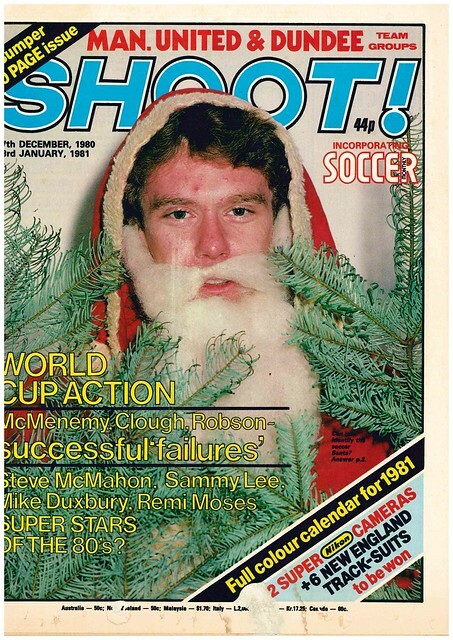 Santa Claus of North Pole United in the cover star of Shoot, as the first Christmas of the 1980s approaches. Except, that it’s not Santa Claus, it’s a footballer dressed up as him. All will be revealed on page 2. 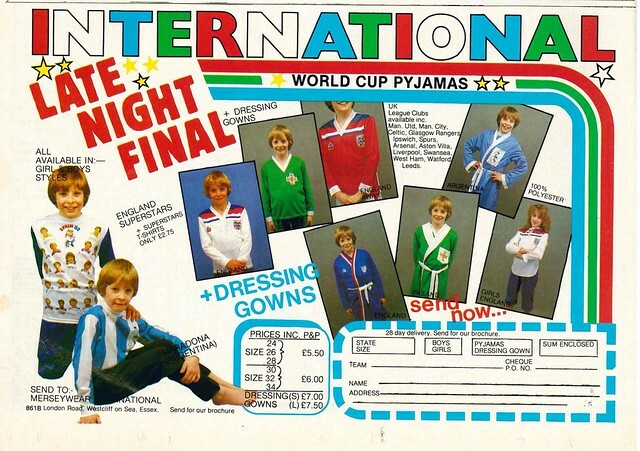 Out mystery Santa is someone who enjoys dressing up in red and white, Tony Woodcock of Arsenal. 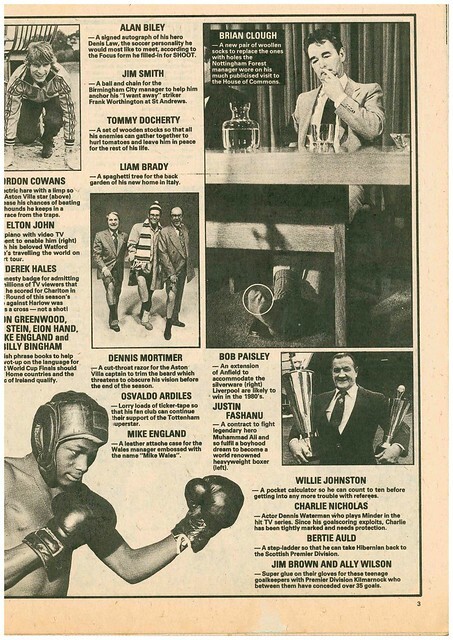 Shoot gets in the Christmas spirit by suggesting presents for various football personalities, with a razor for bearded Aston Villa player Dennis Mortimer, while Watford chairman Elton John is suggested a piano with a TV screen so that he can watch Watford matches while he is on tour. 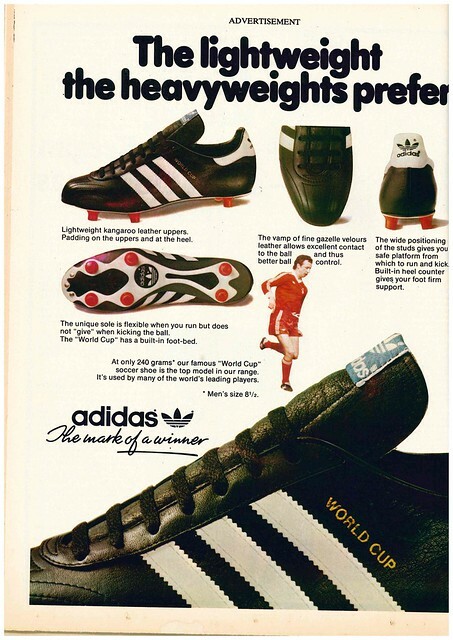 I’m not sure that has actually been invented. I might just try and copyright that. Shoot reviews the first-half of the English league season, with Liverpool and Aston Villa level on points at the top, with Liverpool looking to become the first team since the 1930s to win 3 titles in a row, while Aston Villa are looking for their first title in 71 years. 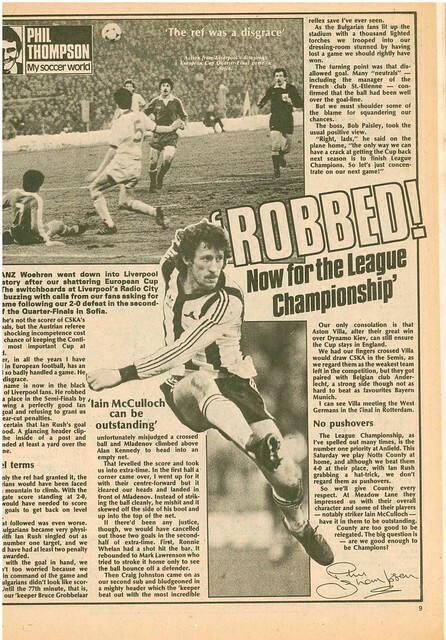 Eamonn McCabe, Sports Photographer Of The Year, gets a double page spread showing his favourite photos from 1980, while there is a competition to win a camera. 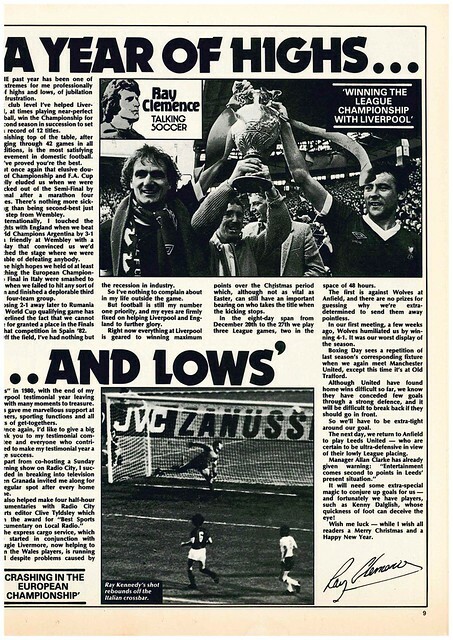 Ray Clemence uses his column to look back at the year, with the high of Liverpool winning the league and a low of England’s group exit at the European Championship. 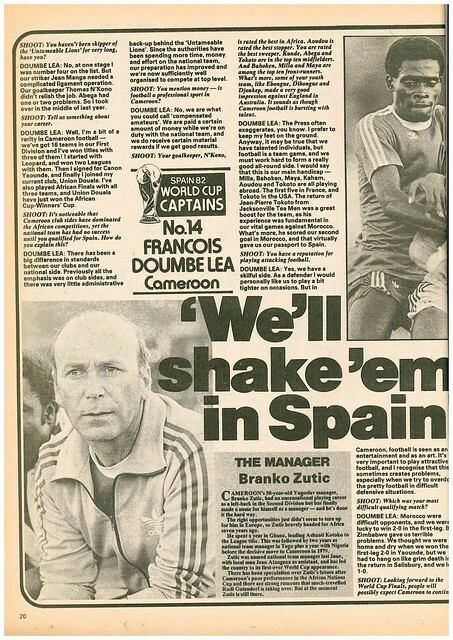 There is a double page photo collage of Wales and England’s recent World Cup Qualifiers, with the headline “Spain – Here We Come”. 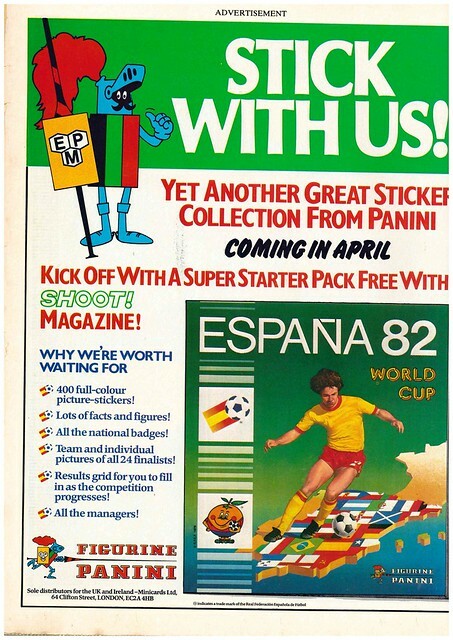 Wales didn’t make it to Spain, and England just about qualified. 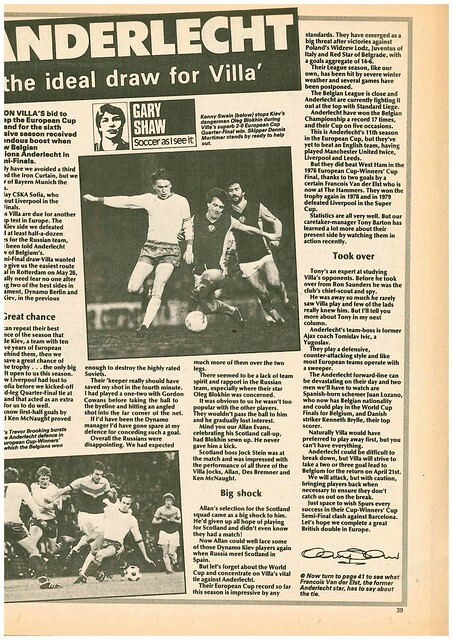 Liverpool’s reserve team gets a full page feature, asking four of their players – Ian Rush, Howard Gayle, Steve Ogrizovic and Richard Money – what it’s like to play for Liverpool’s reserves. 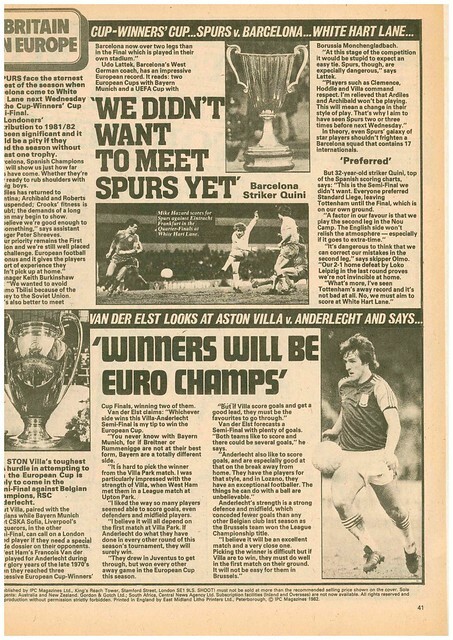 Liverpool’s title rivals Aston Villa are featured on the next page, looking at their “Dunfermline connection”, as two players from the Fife town, Allan Evans and Ken McNaught, playing their part in Villa’s title bid. 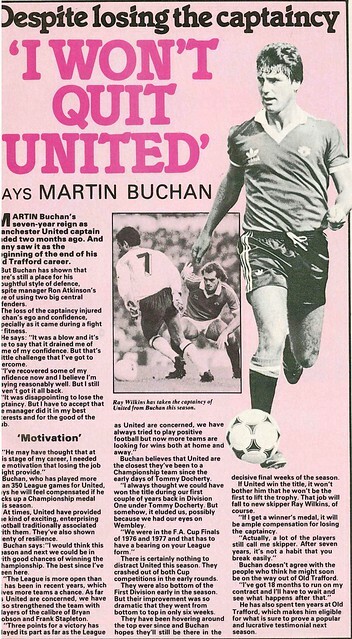 In news, Graham Gooch is training with West Ham to keep himself fit during Cricket’s off-season. 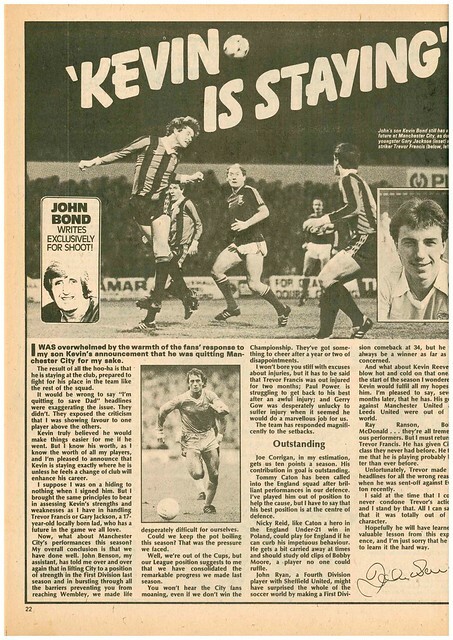 Shoot does a feature on “Forgotten Heroes”, the players who are struggling to get first team action in 1980. 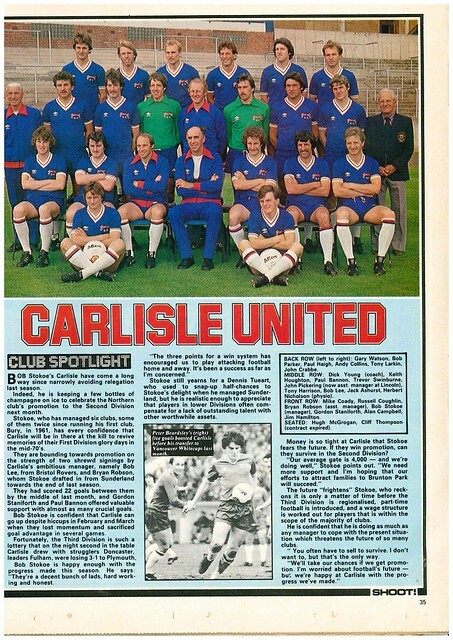 Dundee get a team poster while Phil Neal gets a player profile. His favourite music is Michael Jackson, Gerry Rafferty and ELO. 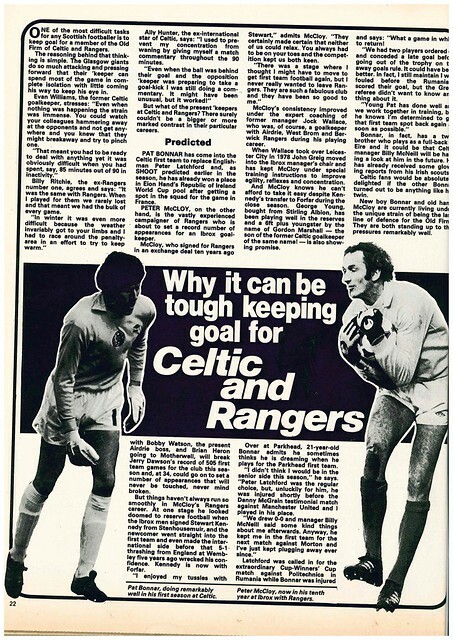 There is a joint interview with Peter McCloy (Rangers) and Pat Bonner (Celtic) about what it’s like to play in goal for an Old Firm team. 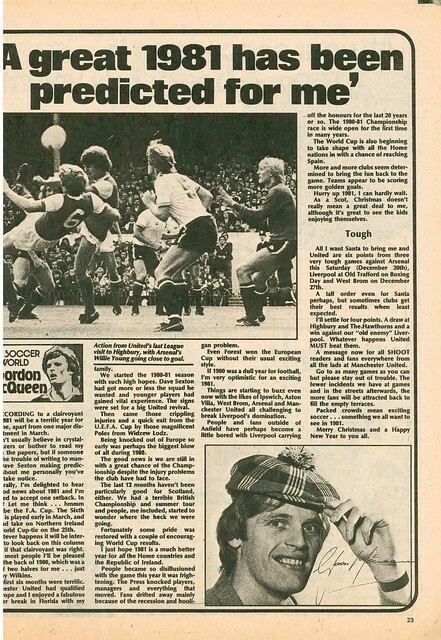 Staying in Scotland, Gordon McQueen uses his column to look back at 1980, and reveals that a clairvoyant that a great 1981 has been predicted for him. 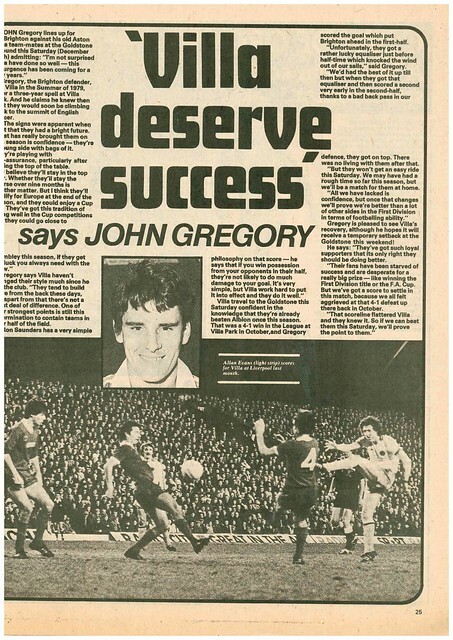 Aston Villa travel to Brighton over Christmas, and John Gregory of Brighton, a former Villa player, tells Shoot that the club deserves success. 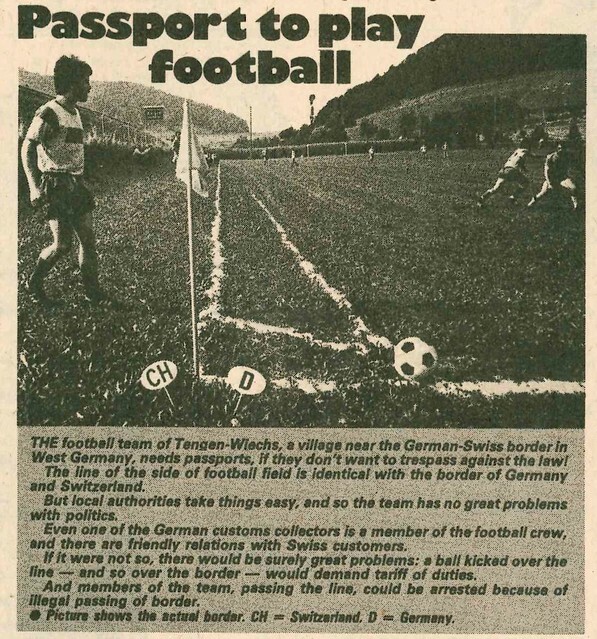 In South America, Uruguay were hosting a tournament to celebrate 50 years since the first World Cup, involving all former winners. 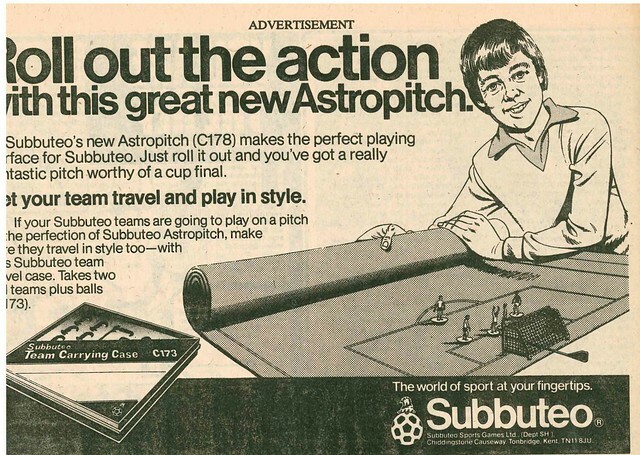 England declined the option as it would have involved postponing league games over Christmas. 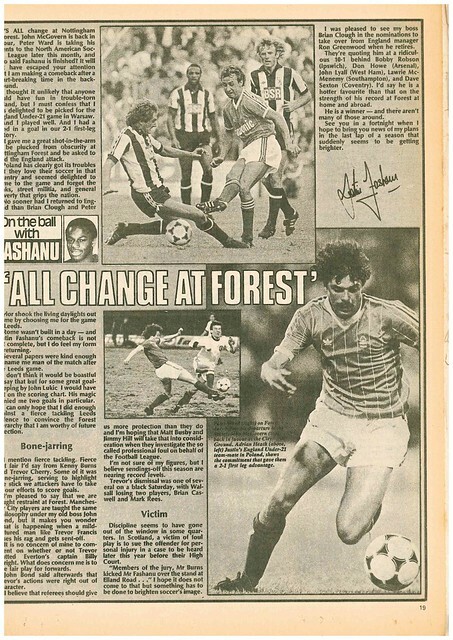 Meanwhile, Shoot does a joint interview with Diego Maradona and Alfredo Di Stefano. 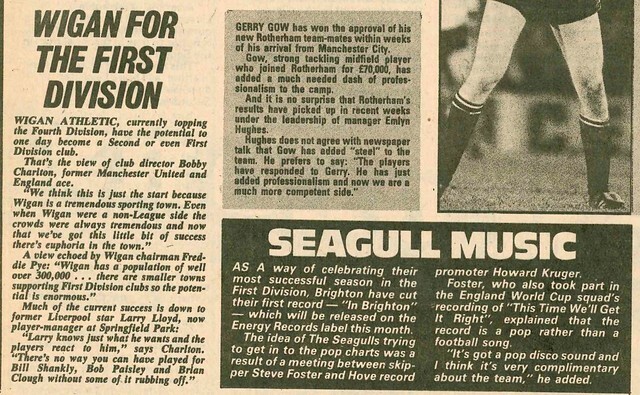 Clive Allen uses his column to state that he is looking forward to Crystal Palace’s trip to Southampton, mainly for the opportunity to meet Kevin Keegan. 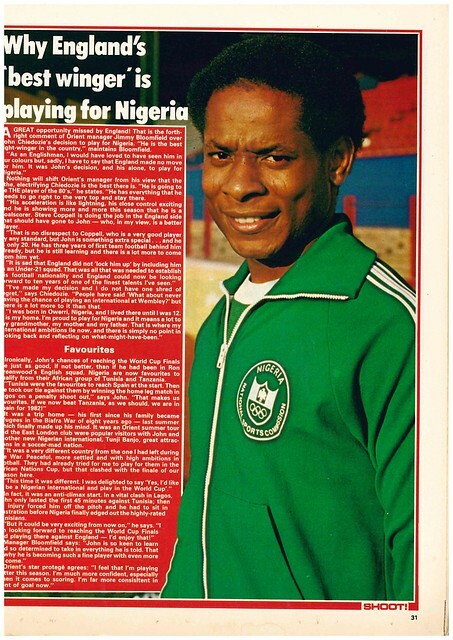 Unfortunately for Ron Greenwood, he was already declared himself for Nigeria. 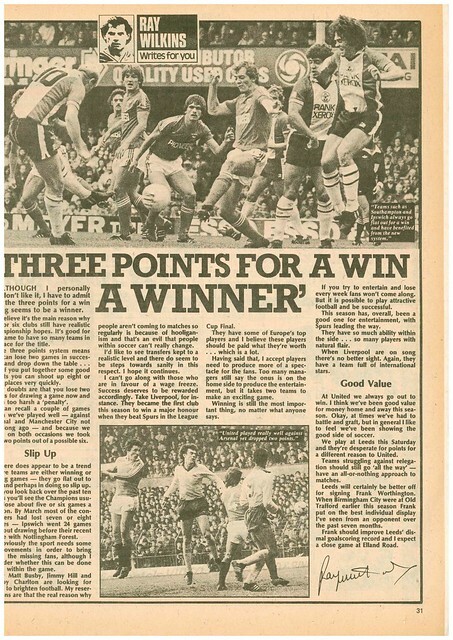 Andy Gray writes in his column about how injuries have benefitted Wolves, as it has presented first-team opportunities to some of their promising youngsters. 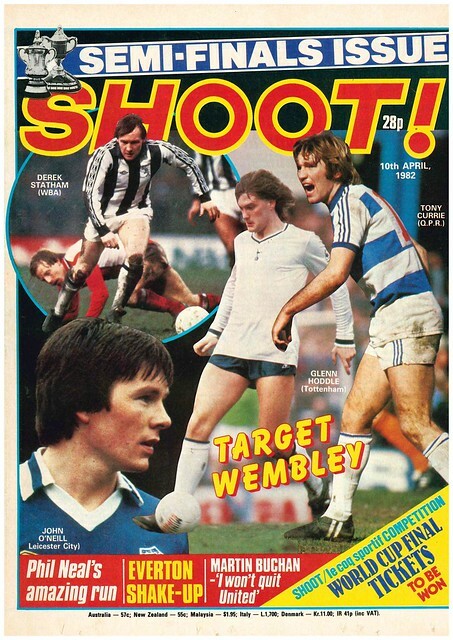 Shoot does a double page spread on players they predict to be “England’s Superstars Of The 1980s”, listing players such as Craig Johnston, Gary Shaw, Steve McMahon, Remi Moses, Sammy Lee, Gary Mabbutt, Peter Beardsley and Adrian Heath to make an impact in the upcoming decade. 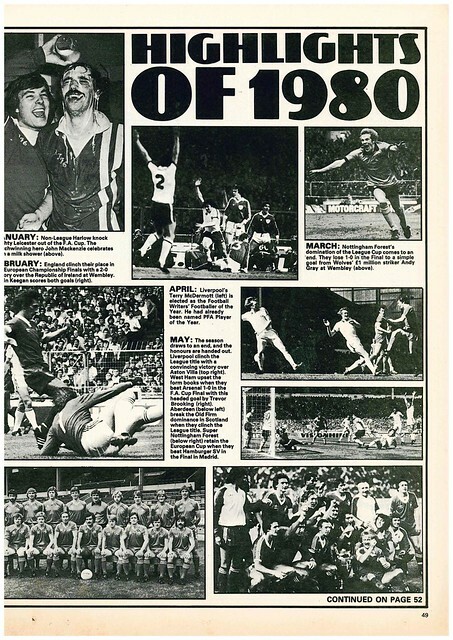 There is a photo compilation of the biggest footballing moments of 1980, while there is a calendar for 1981. 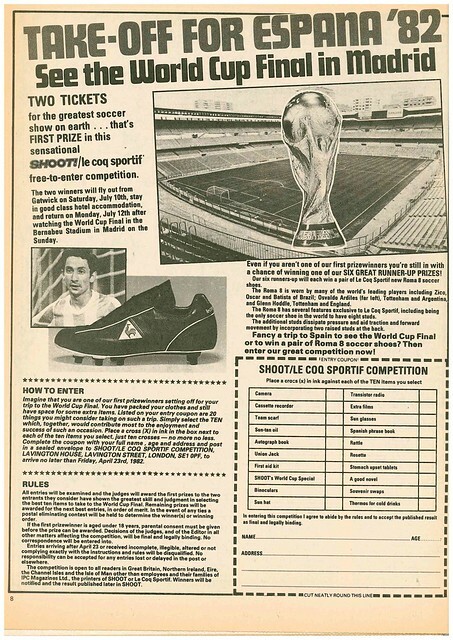 With 18 months to go, the countdown to the 1982 World Cup is already underway, with Spanish clubs spending a combined £50m modernising their stadiums to host games, with Shoot giving a club by club breakdown. 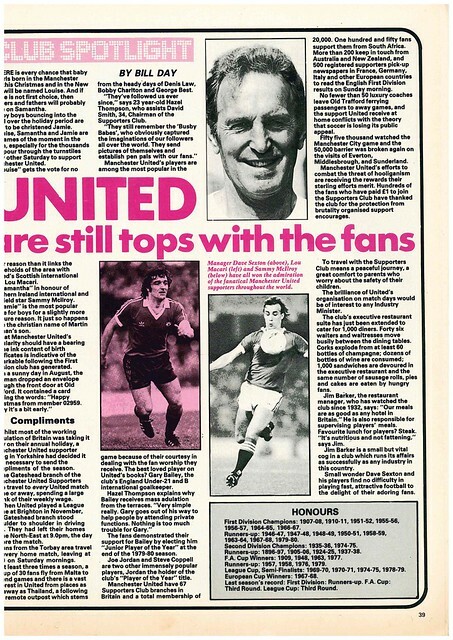 Peter Shilton uses his column to champion Terry Butcher’s cause for a place in the England team, and reveals he’s always been a fan of Tottenham due to the way they played football in the 60s. 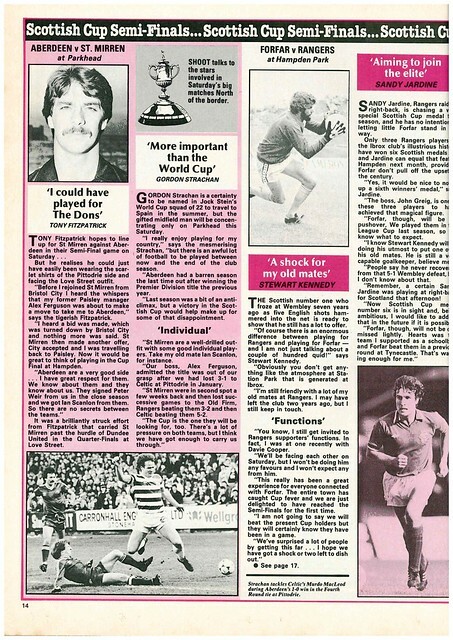 Derek Johnston’s column recalls Andy Cameron’s stand-up routine at the Player Of The Year Awards where he made fun of players of every club, including his beloved Rangers. 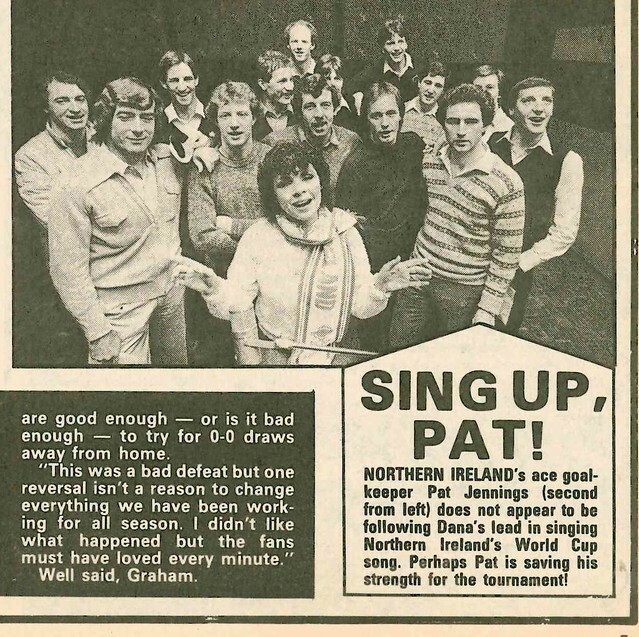 There is also a feature on managers such as Dave Sexton, Brian Clough, Ron Saunders and Lawrie McMenemy who have all went on to bigger things despite experiencing the sack early in their career.